I kid you not! We have 5 coffee trees growing right here on St. Joseph Island! Inside our house of course. 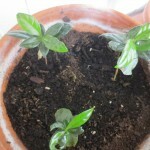 Last year a woman we met while homeschooling our son surprised us with a gift of coffee trees. 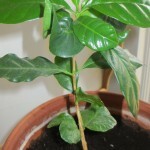 Her husband was in Toronto last spring at the Green Living Show and one of the vendors there had coffee trees. They decided during a phone conversation that those “Coffee People” (as we are known around here) would probably like some coffee trees. And, we do! We transplanted them and they are thriving. I gave a couple to a local woman who has a very green thumb just in case we killed ours off. But, look! There`s even shiny new growth on these babies. We have 5 trees in all, one big, one medium, and three small. 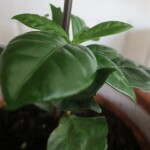 I don’t know what varietal they are, or even which coffee country they originate from, but it’s exciting to watch them slowly grow.